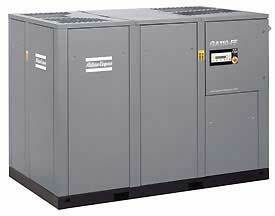 GA compressors are designed to provide high-quality compressed air even under the harshest conditions. The GA incorporates the latest generation of Atlas Copco’s state-of-the-art compression elements based on innovative asymmetric rotor profiles, a high-quality drive system and heavy-duty air inlet filters. Every GA is designed, manufactured and tested to comply with ISO 9001, ISO 14001 and ISO 1217. Its components are made to operate continuously in the toughest conditions and at ambient temperatures up to 55 degrees C / 131 degrees F. The GA Variable Speed Drive (VSD) technology reduces energy costs by 35% by automatically adjusting the air supply to your air demand.